When a new medical device catches our attention, more often than not it has been developed by an American company. Medical Device and Diagnostic Industry (MD+DI) is an online and print publication that focuses exclusively on original equipment manufacturers (OEMs) of medical devices and in vitro diagnostic products. Well, last week MD+DI highlighted eight companies from around the world that have developed innovative and cutting-edge devices, commenting that the winner of the Medical Design Excellence Awards for 2015 was a wheelchair for indoor- and outdoor-use, manufactured by Krabat of Norway. 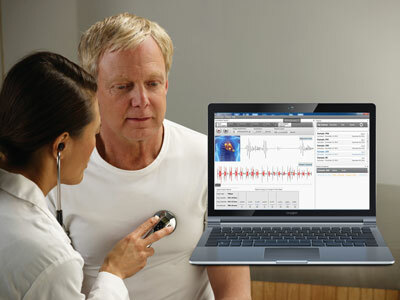 Among the featured products was one from South Africa – SensiCardiac developed by Diacoustic Medical Devices of Stellenbosch – that combines software with an electronic stethoscope to help doctors diagnose cardiac disorders (seen at right). The heart sounds are recorded and then analyzed with sophisticated algorithms to provide an assessment that would normally require a cardiologist’s expertise and years of training. An Indian startup called InfraEyes has designed and begun to market a product that assists a doctor or nurse find a patient’s vein. 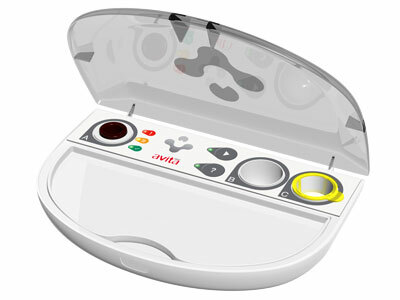 The Veinus device is battery powered and uses infrared light to show the healthcare worker exactly where a vein is located, thus facilitating the insertion of a needle. A South Korean company called Ybrain has invented a device – a wearable headband – that uses electro-stimulation to treat patients with depression, mild cognitive impairment and other neurological disorders. FinlTop Biology is a Chinese company that has miniaturized an ECG device which connects to a smartphone using Bluetooth, enabling the remote monitoring of a patient. A Japanese company called Cyfuse Biomedical has developed a 3D printer that uses a robotic arm and modelling software to pick up and assemble cellular spheroids into any desired 3D tissue or organ shape. Avita Medical is a British manufacturer of a kit called ReCell (seen at left) which allows a clinician to harvest a skin sample from a patient and then “grow” more skin using Regenerative Epithelial Suspension (RES). Taking just 30 minutes, RES enables an area 80 times the size of the original sample to be covered. Finally, two French companies are featured: Gecko Biomedical has developed a tissue adhesive for wound closure; while Pixium Vision has designed a system that combines a miniature camera, processor and retinal implant to restore sight for blind patients. Not invented here – the other NIH – is often a response an engineer will hear, but these eight examples show that creativity is not limited by geography. With regard to the Sensicardiac image – can this new stethoscope be used to auscultate through clothing? Interesting …. Also, some years ago bioengineers at UCT were involved in the use of cell phone technology for cardiac diagnostics – what has happened to that innovation? Does anyone know? Good observation about the auscultation through clothing. Although we don’t recommend auscultation through clothing one must note that there’re fundamental differences between the electronic stethoscope and an acoustic stethoscope. Electronic stethoscopes don’t work with a diaphragm to translate the sound (vibrations) from the body’s skin to your ears (making it very important to have skin contact in the case of acoustic stethoscopes), but an piezo-electronic sensor to translate the vibration to an electronic signal. The further you are away from the “vibration”, or the more layers you have in-between, the more attenuation you will get.